If it hasn't become clear from my travel stories about Philadelphia, and Washington, DC—I have a thing for historic cities that do food and drinks as well as they do museums and monuments. After this weekend I'm officially adding Boston to that list, completing a trifecta of amazing not-too-far-from-NYC cities. Even though we definitely could have, we didn't spend the whole weekend luxuriating in our Heavenly Beds. Meghan and I covered quite a bit of ground from Newbury to the North End, and basically ate every single thing our hearts desired. 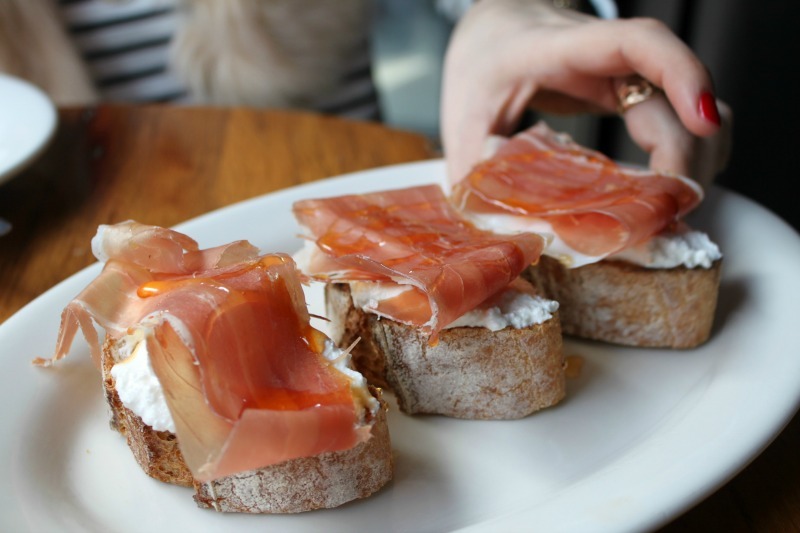 ALDEN &HARLOW: Before departing for our getaway, I spent quite a bit of time on Boston's Eater lists looking for the most buzzy and delicious restaurants in town. One that caught my eye—mostly because of its "secret burger" was Alden & Harlow, in Harvard Square. We hopped in an Uber Friday night and arrived at this cool, dark subway tile-lined spot and sipped on Old Fashioneds as we waited for two seats at the bar. The famous burger had sold out for the night, but we were more than satisfied with grilled octopus, pesto monkey bread, New York strip steak, as well as duck and pork campagne. MIKE'S PASTRY: Meghan and I make excellent travel buddies for many reasons, but one of the funniest ones is our extreme craving leans: I was dying for salty chowder and lobster rolls; she was insistent on sampling Boston's iconic sweets: cannolis and Boston cream pie. I had never actually had a cannoli before, and though I probably wouldn't wait 25 minutes in line for one of my own, when I tried Meghan's I couldn't deny the appeal of the rich ricotta dotted with chocolate chips and wrapped in that crisp pastry shell. Mike's is a North End institution, and we were able to make our way through the line and enjoy bites of cannoli and cream pie in the street while we were waiting for our late lunch table at Neptune Oyster. If you're a sucker for sweets this is a can't miss confectionary. NEPTUNE OYSTER: I didn't anticipate that Boston would have the kinds of restaurant wait times you experience on the regular in New York, but we found it at Neptune Oyster. 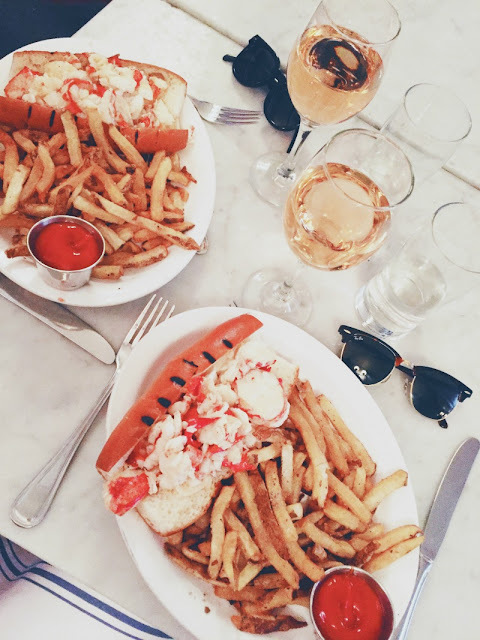 After reading that theirs were voted the *best* lobster rolls in Boston, Meghan and I headed to their North End location to put the rating to the test. We gave the hostess a contact number and were told it would be about two hours before we could be seated! After whiling away some time wandering the North End feeding Meghan's cannoli craving at Mike's Pastry and downing a crostini and a couple beers at Locale, we returned and were rewarded with a prime corner booth. A cool $90 later, we were sitting before two of the most gloriously overstuffed lobster rolls, heaps of salty, seasoned fries and two generous pours of Corsican rosé. It was without a doubt the most decadent and delicious lunch of my life, compared only to my lobster tour of Maine this summer. These are rolls worth the wait, I promise. STEPHANIE'S ON NEWBURY: According to my girlfriend who went to Tufts, having brunch at Stephanie's on Newbury is one of the necessary stops on Boston's "eating like a local" tour. This upscale spot definitely lived up to the hype—the Belgian waffle was one of the most delicious breakfast foods I have ever tasted, and I was only sad I didn't get to have more (since Meghan was the smart cookie who ordered it). 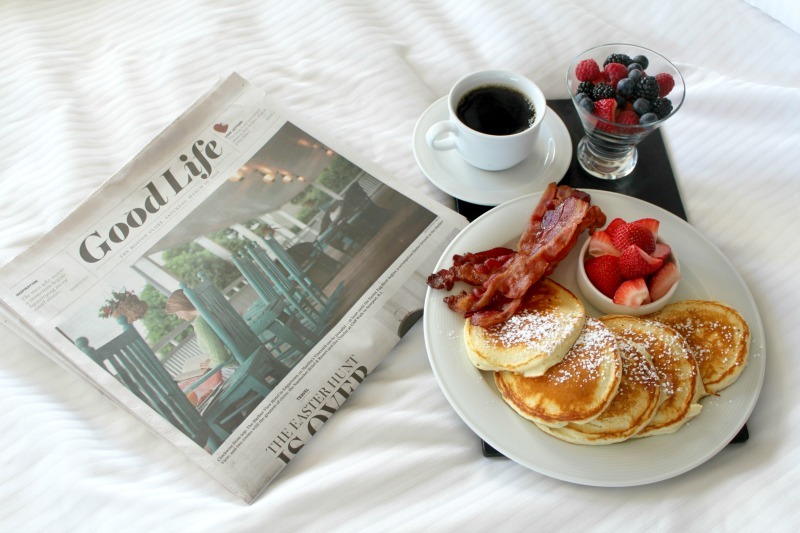 I opted for scrambled eggs and bacon—which, as simple as they are, were absolutely perfect. We dashed in for a quick breakfast before our train back to NYC, and next time I'm determined to linger over one of their "famous" Bloody Mary cocktails. 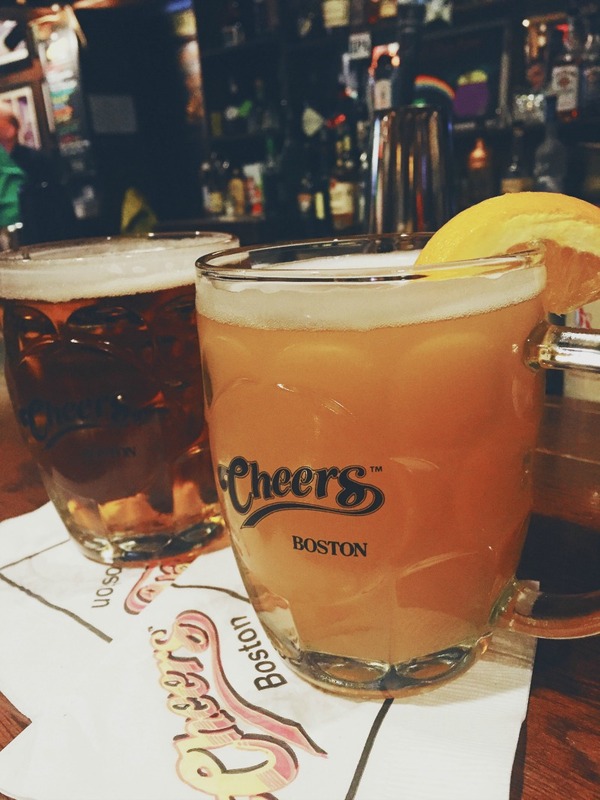 CHEERS: Sorry I am not sorry that this is the only bar making it onto my Boston travel guide. I had every intention of checking out more bars but we didn't because we were, frankly, too busy eating and relaxing in our suite. In case you live under a rock, this is the original bar in Beacon Hill that inspired the show Cheers—but not to be confused with the replica bar in Faneuil Hall. Cheers actually isn't overrun with tourists, and Meghan and I were able to pull up to the bar and grab a couple of seats with no fuss. Yes, the Cheers theme song plays in the vestibule, and yes I annoyed Meghan all weekend long by singing, "Making your way in the world today takes everything you've got..." at random moments. SEE THE RED SOX AT FENWAY: Spring training was still going on during this trip, but an ideal trip to Boston is not complete without catching a game at Fenway Park. The last time I was in town to visit my cousin several years ago, we went to two Red Sox vs. Mariners games and I found the atmosphere of the place to be so special. It's historic and rowdy, full of incredibly passionate fans and an ideal place to spend a few beer-soaked and sunny hours on a warm summer or fall evening. 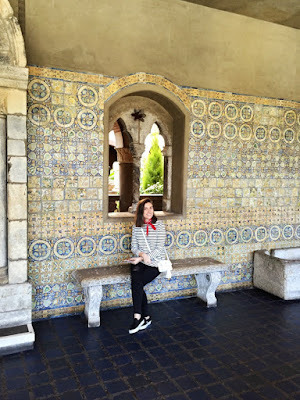 ISABELLA STEWART GARDNER MUSEUM: One of my absolute favorite things to do when visiting a new city is to seek out one of its smaller museums to experience a slice of that city's culture on a more intimate scale. In Philly it was the Barnes Foundation. In DC it's the Phillips Collection. 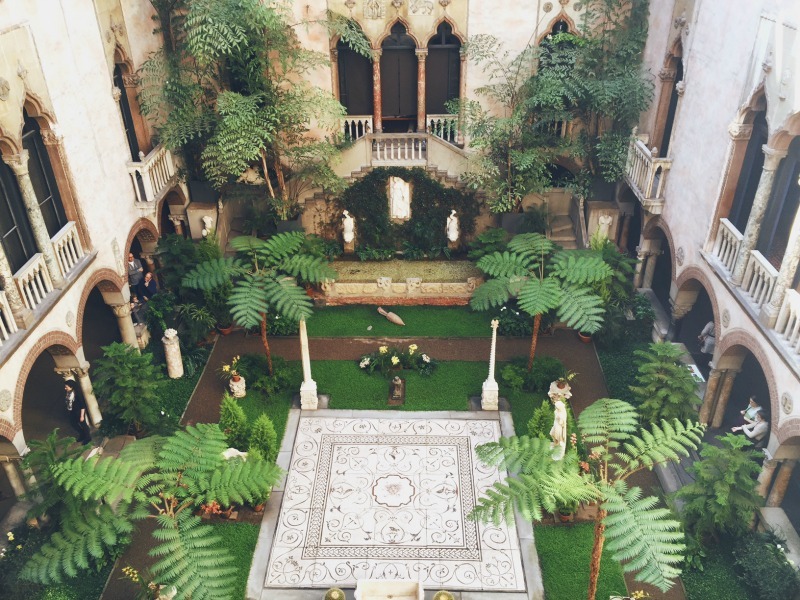 In Boston, you must make time for the Isabella Stewart Gardener Museum in the Fenway neighborhood. Like the aforementioned art museums, this is one that is essentially the collection of a single (very wealthy) person. You can take in the Matisse, John Singer Sargent, Rembrandt and Botticelli works in about 40 minutes—but the real showstopper of this museum is the plant-filled atrium the galleries are built around. As you sit on a bench admiring all the flora and fauna, read up on the incredible story of the 13-piece burglary that took place at this museum in 1990. BOSTON PUBLIC GARDEN: Meghan and I got caught in a brief rainstorm as we tried to meander the Boston Public Garden for a bit, and it is at the top of my list of places to return to when the weather has improved and the place is alive. Created in 1837 in the height of the Victorian era, I can only imagine how vibrant and lush it must be with water in the ponds, flowers in bloom and leaves on the trees. Even so, there was still plenty of beauty to behold, and the Garden (with a stop at Cheers just across the street) is a must for any visit to Boston. 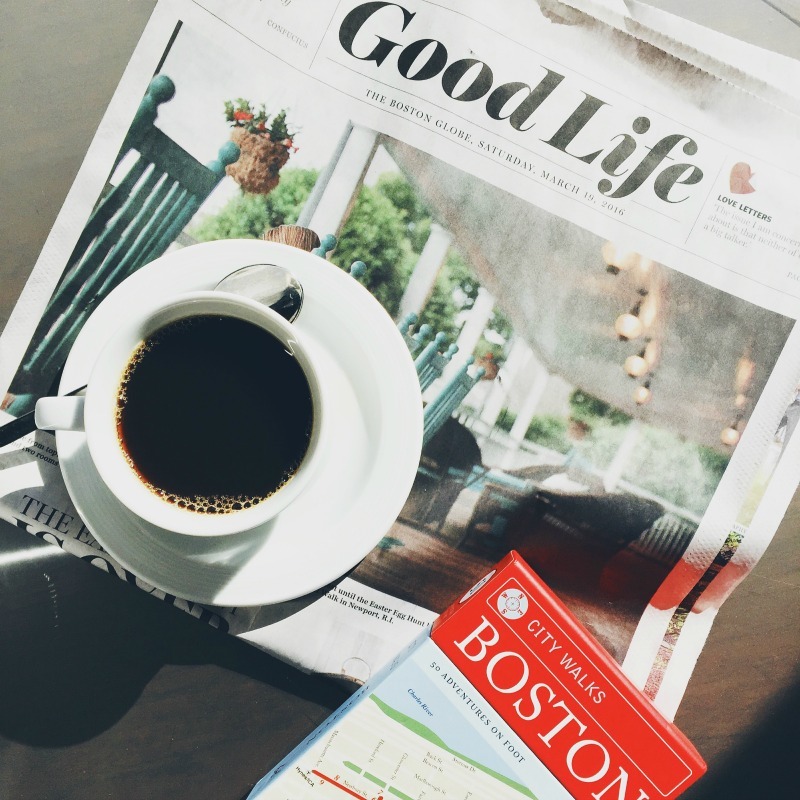 WESTIN COPLEY PLACE: Since our stay was timed around National Sleep Day, our weekend was all about indulging in Westin's Sleep Well program. 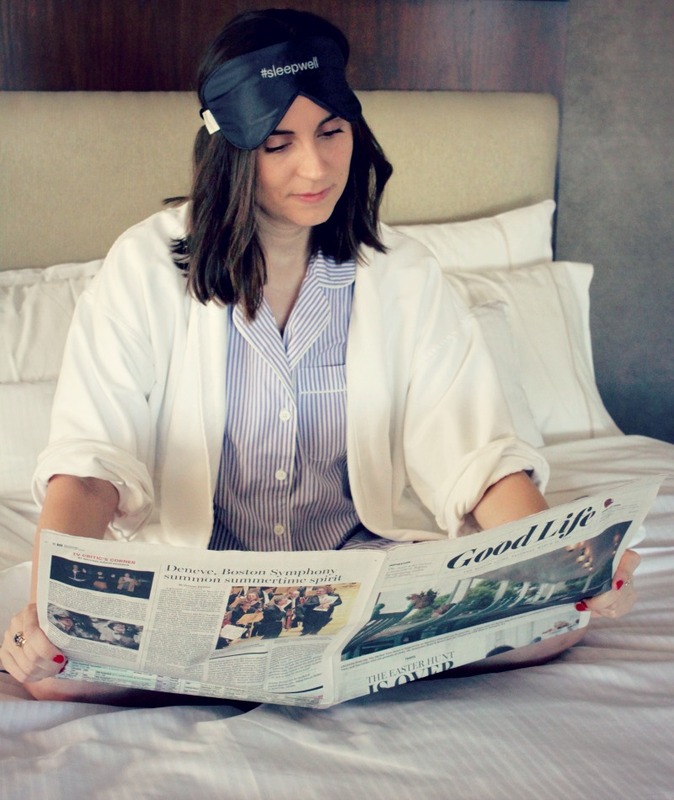 From their Heavenly Beds (truly the best hotel sleep you'll ever have) to late check-out on Sundays and all-day breakfast service, we took advantage of just about every excuse to hang around in our room and relax. We watched Friends in our robes while drinking wine and watching the sunset, ate breakfast in bed, and soothed our (very full) tummies and quieted our minds with tea before bed. 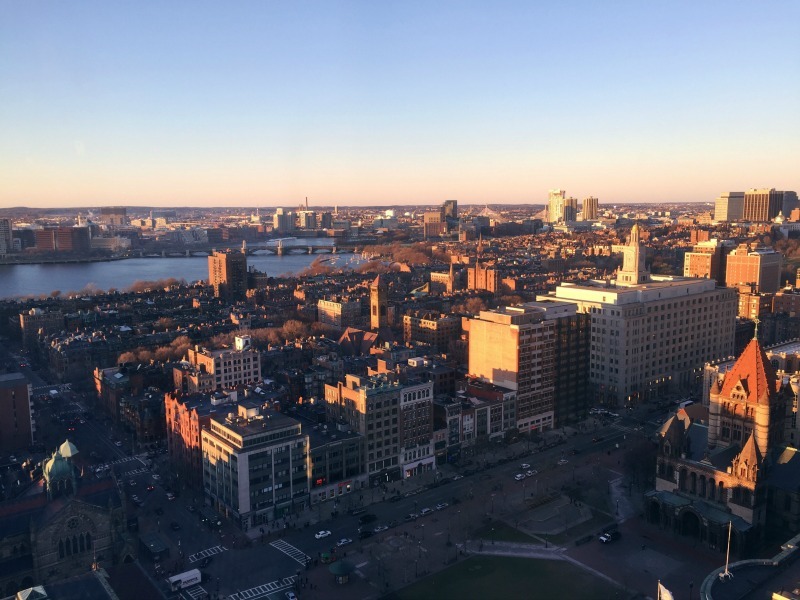 Like DC (and Philly if you're feeling luxe), Boston is a city best accessed by train, but you can do it by bus in a pinch. Meghan and I took Amtrak to the Back Bay station which put us just across the street from our hotel, as well as Trinity Church—and it's just a few blocks from Newbury Street. 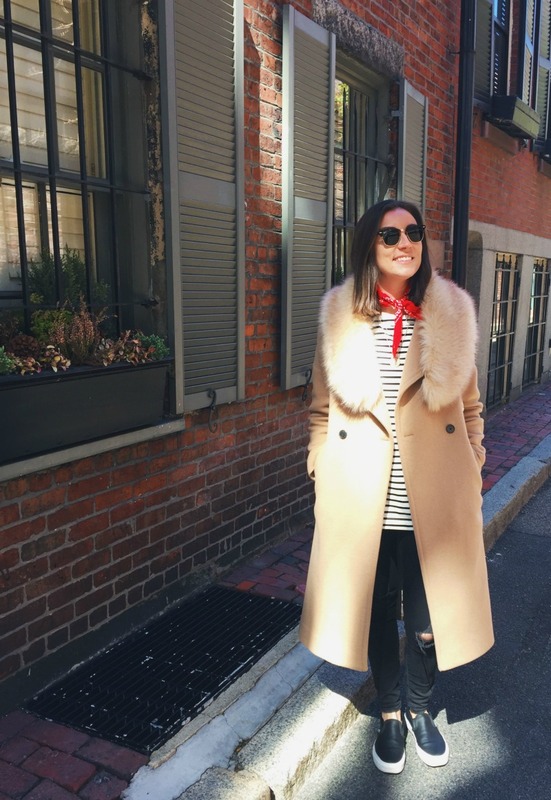 I'm already hoping to go back to Boston in the late spring or early summer, any suggestions out there? Disclosure: This post (and the accompanying Instagrams) were sponsored by Westin. Thank you for supporting the content that makes SHUT UP I LOVE THAT possible! Damn, Erica! These are all SUCH good tips. I think I read that the same people own Neptune and Row 34? which means double the lobster roll potential! Thank you so much for all these idea... Now I KNOW I have to come back for more sweets, market adventures and a brunch burger.